If you didn’t already hear, the Sheraton Suites Tampa Airport Westshore (the big pink hotel on Cypress Ave) is currently undergoing a $13+ million renovation. These renovations, set to be complete by this November, are refurbishing and modernizing the entire interior of the Westshore District all-suites hotel. 5. Meeting Space. Meeting space will increase to more than 12,000 square feet. That means more area to hold state-of-the-art meetings in a modern and inviting environment in the heart of the Westshore District. 4. Tropical Atrium. The refurbished eight-story tropical atrium is the ideal place to hold an ‘outdoor’ wedding ceremony, indoors. The largest atrium in the area, it contains some of the most unique indoor landscaping around. 3. HD TVs. 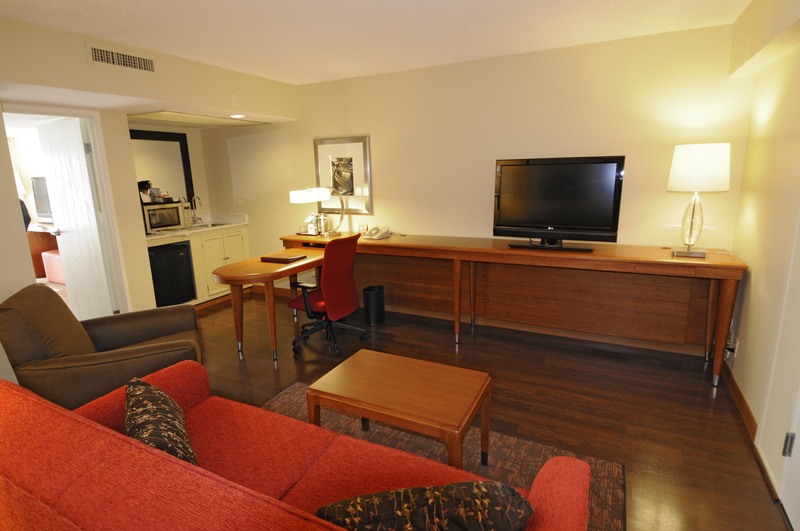 Two 32” HD flat panel televisions in EVERY suite. Sweet! 2. The Link. Stay connected with the addition of the “Link@Sheraton” in the lobby and atrium area. With this modernized, bar-side, open-style Internet café and business lounge, you won’t ever work alone in your hotel room again. 1. New Jobs. The construction created more than 140 jobs in the area. In the economic times we face, you just can’t beat that kind of job creation. And there are many more. Some say the updated fitness room and pool are already their favorite addition. Others are awaiting the opening of the brand new St. James Restaurant. You will have to decide your favorite features for yourself. Feel free to stop in and see the inside of the new Sheraton anytime, or check out the website at http://www.sheraton.com/tampaairport. Stay in the loop with Tampa Bay hotel updates by continuing to monitor this blog!